Maintain agent productivity and high-quality customer service through simple cloud monitoring and coaching. Supervisor was made with supervisor-specific needs, tools, and responsibilities in mind. Our role-centric, user-friendly design allows them to easily monitor real-time metrics for both the entire floor and individual agents in one, all-encompassing view. No matter what demands your supervisors' attention, Supervisor keeps them aware, informed, and ready to act — helping them do more for your contact center in less time. Every customer interaction affects the entire floor's success. 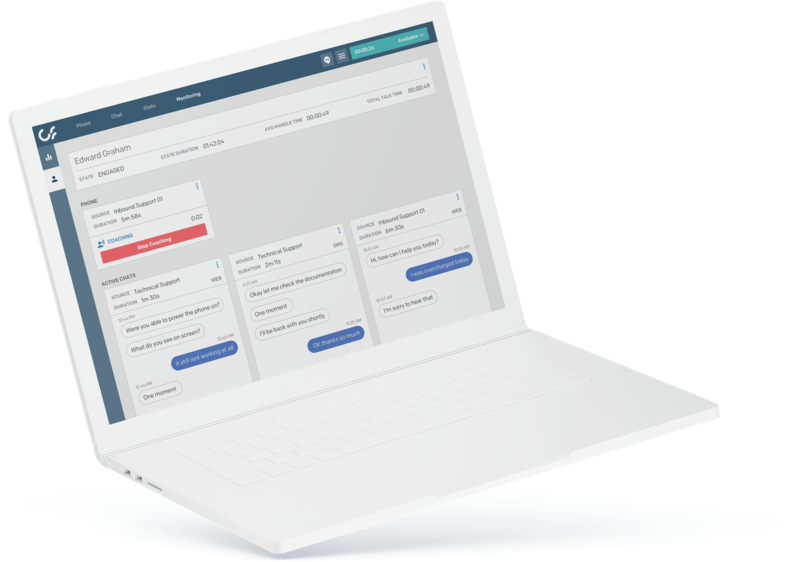 With one click, our whisper tool allows supervisors to use voice or chat to monitor and coach agents through any omnichannel conversation. Or, if an interaction escalates, supervisors can speak directly with the customer through the barge in tool. This real-time, interactive coaching keeps agents empowered and supported, boosting productivity, results, and agent retention throughout your organization. With Supervisor's customizable, at-a-glance dashboards, your supervisors can monitoomagent activity, including chats and calls from a single screen, in real-time. This simple, comprehensive interface allows them to keep agents fully maximized, while also monitoring queues and campaigns. 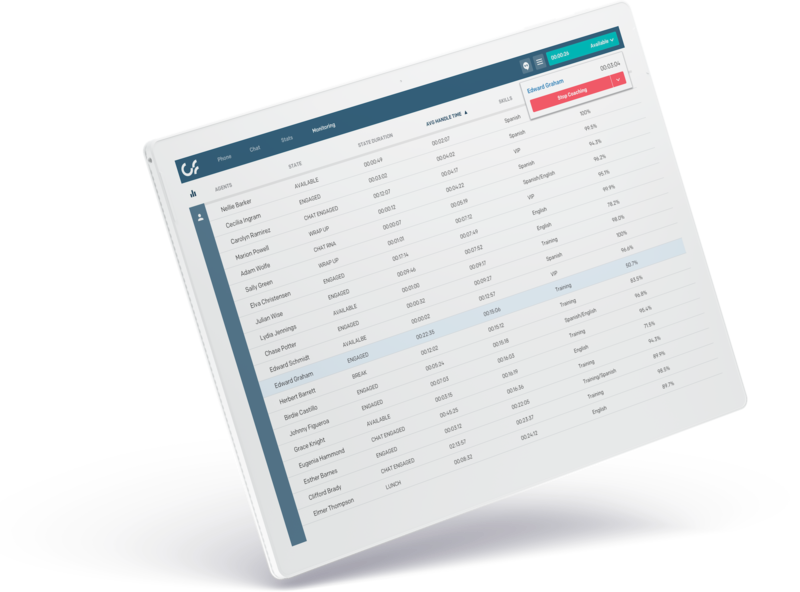 From current to past data, our interface provides information on the floor or on an agent with minimal clicks. 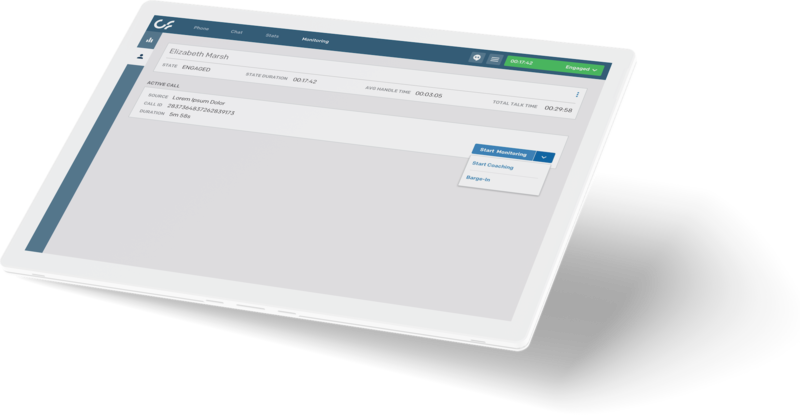 Access the full suite of tools and features available to agents, plus supervisor-specific capabilities — all from a single sign-on. Listen in on real-time calls or record calls for use at a later date. You can also easily search by agent or date in the recorded calls library. See an agent's current chats and chat history from a single screen. Coach agents in real time by typing directly into chats without the customer ever seeing. Offer agents guidance and coaching during live calls or chats without the customer ever knowing. Easily tab between screens in a single interface, switching between taking calls, sending chats, seeing queue statuses, and monitoring agents. Keep teams of agents up-to-date on performance levels and KPIs with customizable, easy-to-view, real-time dashboard displays. Use the internal chat tool to conduct internal team communications and inform and update agents, contacting individuals or groups simultaneously. When call volume is high, jump in and take calls to help reduce queues or wait times without having to log out or switch screens. Coach agents through calls and chats while minimizing call wait times with intuitive UI and quick-view analytics. Our supervisor-specific dashboard gives up-to-the-minute agent stats, allowing supervisors to quickly take action when needed. Make informed decisions with the comprehensive data offered by our intuitive dashboards and reliable analytics.